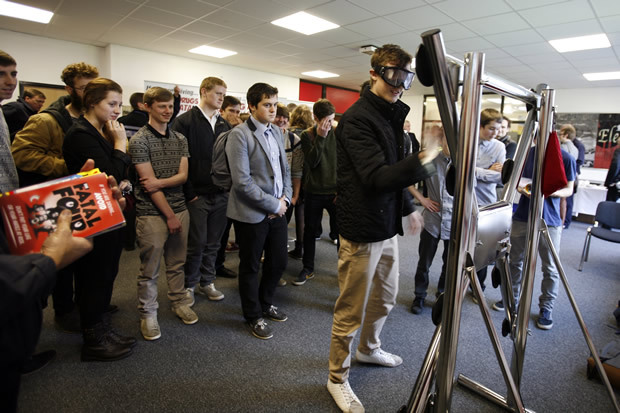 A car crash simulator device has been used by young people in the Leicester and Rutland areas to try and reduce the number of road traffic accidents. According to First Car, drivers under 25 are most likely to be in a collision, with Friday and Saturday being peak times for crashes. The Samsung Gear VR powered by Oculus virtual headset is being put to use by the Leicestershire Fire and Rescue Service (LFRS) as part of its ‘Fatal Four’ campaign to teach young people the potential dangers of driving. Fatal Four, is a campaign to highlight the four biggest dangers in driving; speeding, using a mobile phone, driving under the influence of drinking and drugs and not wearing a seatbelt. Young drivers are able to watch themselves on the Samsung Gear VR getting medical treatment, see others around them with injuries at the scene and being cut out of a smashed up car. Another girl stated she didn’t want to get in a car now after explaining it really makes you think how stupid people are to mess around on the roads, whilst it was clear all participants felt fear, with elevated heart rates and feeling shaken up afterwards. Virtual Reality Fatal 4- 360 (VF4 360) gives young drivers the ‘most realistic experience’ of a road traffic collision from the front seat passenger's perspective, using latest Samsung technology through headsets and earphones to provide an immersive and intense car accident experience. Samsung stated that its technology completely changes how you experience different driving scenarios: “Put on the Gear VR, and you're there in the moment. A Super AMOLED display, wide field of view, precise head-tracking and low latency brings reality to the virtual,” said a Samsung spokesperson. Launched back in November 2015, the Samsung Gear VR has bordering on 200 apps already. Oculus co-ventured with Samsung, so the device is designed only to work with Samsung phones, with a range of the Galaxy smartphones being compatible with the headset. However the virtual reality headset has been praised for the realism it provides, so much so that Alton Towers recently opened a rollercoaster, Galactica, augmented by the use of Samsung VR headsets to simulate a trip into space. The design of the Gear VR includes a wider interface and is now 19% lighter compared to Samsung’s previous model. It contains a larger touchpad for easy and accurate control. The weight of the headset minus the phone that is used in combination is 318g.